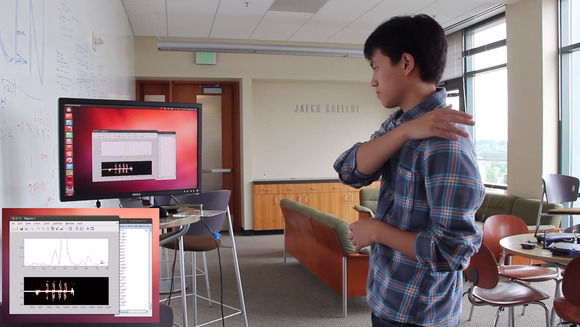 While Microsoft teases the public with tantalizingly advanced gesture controls via the Xbox One’s next generation Kinect sensor, a research team at the University of Washington has developed a way to enable gesture control across all devices using the Wi-Fi router in your living room. Your Wi-Fi router and growing array of connected devices already flood your home with a torrent of wall-traversing signals. When solid objects—like, say, a human—move, they slightly alter the frequency of the Wi-Fi signal via the Doppler Effect. The UoW research team developed a way to transform a standard Wi-Fi router into a “smart receiver” so it can register these ever-so-slight signal alterations and translate them into actionable commands. The technology, which the team has dubbed WiSee, has been used to identify nine distinct human gestures ranging from a swipe of the hand to “full-body bowling.” Researchers have found that a single receiver can recognize up to five different users when fitted with multiple antenna that “tune” into a specific person. In the future, your router will know what you're doing. Kan we kick Kinect to the kurb? WiSee has distinct advantages over gesture tech such as Xbox Kinect. First and foremost, it will be simpler and cheaper as it is adapted from technology that we already have lying around. Additionally, WiSee doesn’t require users be in the same room as the device they want to control as signals readily travel through solid walls. From an application point of view, this means that any potentially Wi-FI-enabled electronic device in your house can become gesture-senstitive and controllable from just about anywhere in your home. So with little more than a wave of the hand, users will be able to turn lights on or off from the couch, raise the volume of the TV from the next room, or open the garage before you get outside. And if you’re wondering how you would stop a neighbor or hacker from taking control of your devices, the team forsees a specific repetition gesture (a sort of dancing password) that users would use to log into their system. The next step for the research team is to develop WiSee’s ability to allow users to control multiple devices simultaneously. As this technology develops, we may be able control an entire home full of technology with little more than a swipe of the hand.